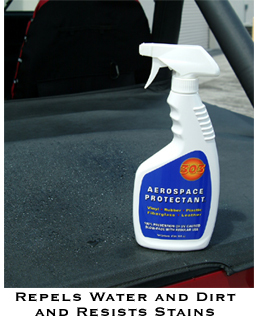 The best protection in the industry for your UV sensitive surfaces 303 Aerospace Protectant! Of all the products offered at the Autogeek, this one has to be the most versatile. Vinyl convertible tops, boat enclosures, tonneau covers, car bras, vinyl RV awnings, headlights, spa covers…these are just a few of the places that benefit from this protectant that contains an SPF 40 sunscreen. 303 Products are highly innovative and technologically advanced. You are a selective consumer and appreciate quality; that’s why 303 Products are certain to meet your standards. You’ll love how easy it is to care for your vinyl convertible top with 303 products; the brand most recommended by leading manufacturers of convertible tops.